Our team is fully immersed in the training we are offering to a group of about 20 Afghans, men and women, from all walks of life: journalists, professors, social workers, and government officials, to name a few. We haven’t been keeping up with the blog as much during this time partially because of the demands on our time and energy, and partially because we’ve been wanting to preserve the sanctity of the retreat space. So, we’ll wait to post photos from the training and specific stories until after the training ends on Thursday. In the meantime, I’d like to use this space to celebrate the phenomenal team I’m working with! I couldn’t imagine taking on a project like this on my own or even with just one other person. It’s been taxing physically, spiritually, and emotionally; at times, all I’m aware of is the desire to maintain a sense of psychic and physical balance (for example, the thought of eating a Pop Tart holds a lot of appeal right now). 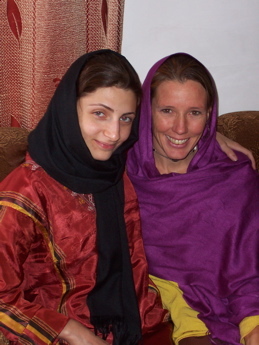 When this happens, I’m completely dependent on the leadership of my partner Catherine, my friend Jiva, and the newest member of our group, our friend and translator extraodinaire, Naghmeh. Together, we have created our own sweet “Fellowship of the Ring”. Each day, we lean on each other, whether it’s holding the empathic space for an emotional explosion over breakfast, taking the lead during the training at a moment when the energy is dipping (all of us are “Ringbearers”), piling onto a bed in the evening to share despair and inspiration, or seeking out the closest replica of orange juice for a team member that’s under the weather. I feel saturated in companionship and interdependence. There is also a surrealness in placing my experience in this place called Afghanistan. Just this evening, I read an online news article on a bombing that happened 93 miles north of here, just a few hours ago. The same surrealness struck me on our flight to Dubai, as I watched our plane fly over Iraq on the in-flight map. Iraq? That’s that place way over THERE, where all the wars happen and stuff. Except now it’s right under me. Afghanistan? I thought it was bombed to nothingness. But, here I am. 3 more days in this mysterious land.